An aerial drone footage has captured the Bardarbunga volcanic eruption as it spews hot molten lava and ash high into the area’s skies. 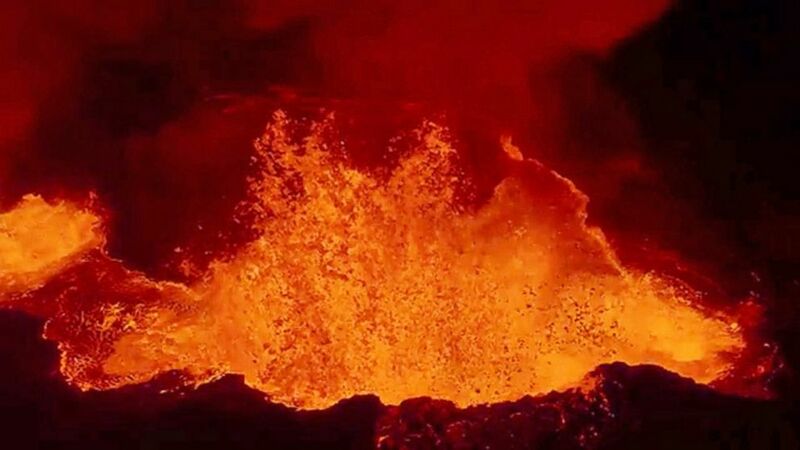 The drone footage shows molten lava and hot ash erupting high into the skies at the Iceland’s most active volcano in Bardarbunga. The crater created by the volcano is getting larger by the day and a great mass of lava cascades down the sides of the mountain. The surrounding area is covered by ash and flowing lava as they spew high into the air, making it certainly impossible for anyone to get near to the area. The Icelandic authorities have closed off the area to safeguard public life. But then, it must be recalled that this lava and ash volcanic eruption started in august before subsiding some bit. The airspace around the area was sealed off and commercial air flights warned to stay clear of the area, even though commercial air traffic still continued undisturbed in other areas of the city. The volcanic eruption that occurred at the Eyjafjallajoekull of Iceland in 2010 caused massive air traffic suspensions across the country. Hundreds of air flights across Europe were also cancelled because for five days, the whole airspace in Europe was covered with ash erupting from the disclosed area of Iceland. This particular one in Bardarbunga is not that serious, but it is something that government authorities are warning residents and international agencies to be aware of.